Learn more about the biggest takeaways from the latest P&G earnings call. Procter & Gamble (NYSE:PG) posted quarterly earnings results on Jan. 26 that included a return to organic sales gains after a rare dip in the prior quarter. The consumer goods titan also cut costs, powering a nice pop in profitability, but its organic sales growth still trails rivals like Kimberly Clark (NYSE:KMB) and Unilever (NYSE:UL). P&G CFO Jon Moeller held a conference call last week to put those mixed results into context for investors. Here are five key takeaways from that discussion. The US business rebounded from a two-point organic sales decline in Q1 to deliver three points of organic growth in Q2. Management was encouraged by the fact that P&G flipped to growth in its biggest market, the U.S. That rebound was the biggest contributor to overall organic sales improving to positive 1% from negative 1% three months ago. However, the retailer is still far from the 3% overall growth pace it enjoyed as recently as fiscal 2014. And the quality of the latest gains isn't as strong, either, given that there were powered solely by price hikes as sales volumes declined. In contrast, Kimberly Clark and Unilever both enjoyed market-beating growth from a healthy mix of price and volume increases. We continue to operate . . . in a very challenging and volatile macro environment. Procter & Gamble cited a weakening global sales environment for holding back growth, as executives started this fiscal year expecting as much as 4% market expansion but now see that number maxing out at 3%. The situation is worse for P&G than for competitors such as Kimberly-Clark and Unilever, which both just posted 5% organic growth, because its operations are more heavily exposed to volatile emerging markets like Russia and China. Its results are also hampered by huge currency swings against the U.S. dollar, which doesn't hurt foreign competitors to the same degree. We continued to dramatically improve productivity with significant upside still ahead. In this environment, management is focusing on what it can control, especially costs. 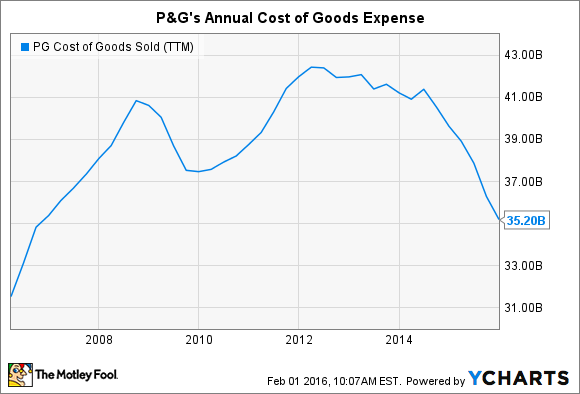 In fact, P&G is ahead of its plan to slash annual operating expenses by $7 billion before the end of 2016. That's why profits are marching higher even as sales stay flat: P&G posted a four percentage point boost in operating margin, leading to a 9% spike in adjusted earnings per share. We returned approximately $3.9 billion to shareholders this quarter through a combination of $1.9 billion in dividends and $2 billion in share repurchase. Those rising profits, combined with stellar cash generation, give management plenty of room to send more cash to shareholders -- even if the growth challenges stretch out for a few more quarters. P&G averaged $12 billion per year of spending on dividends and stock buybacks over the last five years, and the company is on track to boost that to an almost $18 billion annual pace through 2020. We are committed to balanced top line and bottom line growth and strong free cash flow productivity to drive total shareholder return. The company affirmed its full-year guidance that calls for slight organic sales growth, which may end up being flat against sluggish 2015 results. That outlook implies a stronger six months ahead, where management sees U.S. growth leading the way thanks to marketing investments around blockbuster brands like Tide, Gillette, and Pantene. Longer term, Procter & Gamble is still in the process of tightening its portfolio so that it only competes in the product categories with the best outlook for sales and profitability growth. There's a natural drag associated with achieving this balance, but executives believe it should pay dividends down the line. "We're making smart choices for short, mid, and long-term value creation . . . even when these choices create short-term top line pressure," Moeller said.